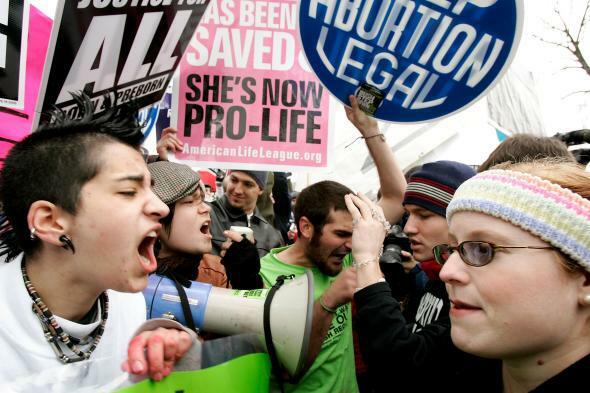 Supreme Court 2014: How far can abortion protesters now go at clinics? How far can abortion protesters now go? Pro-choice activists argue with pro-life activists in front of the Supreme Court in 2006 in Washington. First, an update. In my opening contribution, I omitted from Chief Justice Charles Evans Hughes’ remarkable CV the fact that he was also a former governor of New York. That is important because governorship of a major state is a severe test of administrative ability. I don’t know what the Supreme Court justices have on their cellphones, but considering the justices’ ages—the average is 68—I am doubtful that their cellphones are full of apps and files that would, if accessed, yield much personal information. I am just guessing, based entirely on my own experience with cellphones (I am 75). I have had a cellphone for some years; currently I have an iPhone 4, so already I’m behind the times. I use it almost exclusively to activate my car phone. Not because I make or receive frequent calls while I’m driving—not at all—but because I think it’s important to have phone access when one is driving, in case of having or seeing an accident, getting lost, or missing an appointment because of traffic delays. Very occasionally I check my cellphone for email; it is very occasional because I’m almost always at my laptop at home or my office computer. I do have a few photos on my laptop, mainly of my cat. I don’t think there’s anything else. There are a number of apps on my opening screen, but I don’t even know what most of them are. I couldn’t care less if the National Security Agency is conducting surveillance of my cellphone, and my guess is that the justices of the Supreme Court are equally indifferent to this kind of governmental snooping. I think in short that the Riley decision is best explained as a simple extension of the law limiting physical search and seizures without a warrant. I don’t think it has anything to do either with empathy or with the justices’ cellphone experiences. But I’m just guessing. I want to take issue with Emily’s and Larry’s remarks about the McCullen (abortion protester) case. They make it seem as if all the Supreme Court held was that only Eleanor McCullen, “a short, plump grandmother who just wants to gently persuade women to reconsider as they head into an abortion clinic,”as Emily describes her, and others just as harmless (“elderly counselors trying to speak quietly to women as they passed on the street,” Larry calls them), have a constitutional right to buttonhole, on the sidewalk adjoining the abortion clinic, women coming to the clinic. But obviously the Supreme Court’s decision is not limited to these sweeties, the elderly right-to-lifers who speak quietly to abortion seekers outside abortion clinics. Emily and Larry do not indicate what they consider the limits of the decision to be—whether they think it permits the protesters to speak loudly, threaten damnation, display photos of aborted fetuses, take photos of the visitors to the clinic, and not have reached their 77th birthdays (as McCullen has). Turning to Larry’s criticism of my discussion of the Town of Greece case, I note that the facts he recites are barely hinted at in the dissents. If those are the true facts, they indicate not the mere failure of “inclusiveness” that is the basis of the dissents, but outright discrimination against non-Christians. I was taking the dissents at face value, rather than seeking to construct a stronger case on the basis of facts merely alluded to by them (mainly Justice Elena Kagan). I think it odd, by the way, that she should have suggested that a proper response of the town (though not the only proper response) to the concerns she expresses would have been to tell the clerics to keep their prayers at the town board nonsectarian. She writes: “[L]et its chaplains know that they should speak in nonsectarian terms” and “[urge] its chaplains to reach out to members of other faiths.” In other words, tell a Catholic priest not to mention Jesus Christ in a prayer? Wouldn’t that violate the right to the free exercise of religion in the First Amendment? The town’s website, incidentally, lists 26 “places of worship,” all Christian except for one Islamic association and one Buddhist association—no synagogue. It is hardly surprising that the clerics who give invocations at the town board’s meetings are Christian. Are they to be instructed by the town board to put some Jewish, Muslim, Buddhist, etc. stuff in their invocation prayers so that they won’t sound sectarian? Can that be required by the separation clause of the Constitution that prevents the “establishment of religion” by the government? Had the dissenters prevailed, Town of Greece would have opened a can of worms. McCullen has opened a can of worms. With regard, finally, to Walter’s comment about Justice Antonin Scalia’s enigmatic reference to “the assembling of an apparent but specious unanimity,” we should distinguish between vote trading, which he has not alleged and I have never observed in my 32 years as an appellate judge, and compromise. If compromise consists in giving up a position you are sure is right in exchange for a concession that means more to you, then I think it’s improper; it’s almost vote trading. But very often a judge who is realistic and open-minded rather than dogmatic will realize that he can’t really be confident that his preferred position is correct. Many cases, and many issues in many cases, are tossups, or close to being tossups. And in such a case, if another judge on the panel feels very strongly about it and your contrary inclination is weak, I don’t think it’s wrong to reconsider your position and maybe decide to surrender it.